Slice of Cherry takes place in Portero, a small town where everyone knows each other. Portero is no ordinary town; its residents have special abilities. There are some who can open secret doorways, some who fight off monsters from destroying the town, and others who can ‘settle’ the dead. The story is based on the lives of Fancy and Kit; two sisters who share everything together and are rarely separated. They are the daughters of “The Bonesaw Killer”. Their father murdered many people in their town in his very own cellar, and is now on death row by lethal injection. The town’s people distance themselves from the girls and their mother, Madda, because they fear the girls will follow in their father’s footsteps. One night, a man enters their home and cuts off a small chunk of Fancy’s hair while she is asleep. Kit wakes up in time to see what was happening, attacks him with a switch blade and stabs him in his side. The sisters fear of being caught, so they take the boy down to the cellar, the same cellar their father used to torture and kill his victims. At this point, the girls discover their bloodlust. Fancy convinces Kit out of killing the boy; however, she cannot control the urge to slice him up with her switch blade. Fancy kept sewing up the cuts so that the boy doesn’t die from loss of blood. The sisters face a dilemma; they need to find a way to get rid of the boy without killing him or getting in trouble. Each chapter begins with a short description of a disturbing dream from Fancy’s dream diary. Fancy’s dreams reflect her feelings towards those around her. As the story progresses, the girls find it harder to control their desire to kill. Fancy discovers her ability to open doorways and opens one to her “happy place”, where the sisters can take their victims and no longer fear the law. Dia Reeves has a talent to keep her readers in suspense as things are not outright explained to us, but rather, intricately unfolded throughout the story. Her writing style is truly unique and definitely stands out among all the other paranormal/science fiction novels. The author spends very little time in describing why the sisters are the way they are and jumps right into their present psychotic state. I am delighted to have had the opportunity to read this novel as it captured my interests from the very first line, right up to the very end. I truly admired Dia Reeves’ daringness with this novel. Slice of Cherry is disturbing and entertaining for the most part. The secret doorway to Fancy’s “happy place” was enjoyable, especially finding out how the sisters can manipulate this place to create endless possibilities. I believe Dia Reeves deserves to be commended for her talented writing. Slice of Cherry is, in my opinion, very well written, however, the story may not be for everyone. The author depicts some disturbing images which may come as shock to some. 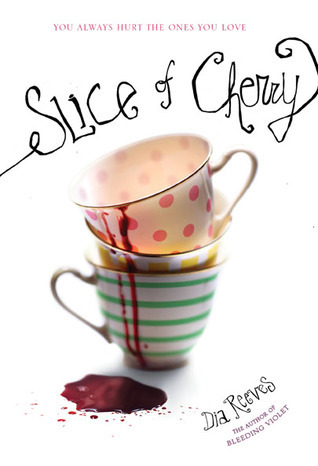 I recommend Slice of Cherry to anyone who enjoys the paranormal and science-fiction genres. Hello Tynga! Thank you so much for giving me the opportunity to review this novel for you! I truly enjoyed thw whole process and cannot wait to do it again :)! What a unique story! I've heard good and bad about it. I think it is a book that you must know what you're getting into. I'm definitely going to read this book. Great review!